In conversation, Kim Roberts refuses to answer some questions, discusses the importance of curating a magazine based on geography and community, argues that not making money in poetry can actually be good, and makes a critical announcement for the future of Beltway Poetry Quarterly. Margaret Corum: I am interested in your founding of Beltway Poetry Quarterly. The internet was exploding in accessibility and popularity during 2000; it must have been an exciting time to start a digital literary magazine. Kim Roberts: My friend Kathy Keler came to me; she’s a visual artist and graphic designer. It was a time when galleries were making the transition from slides to digital images and most visual artists had never used this new technology. 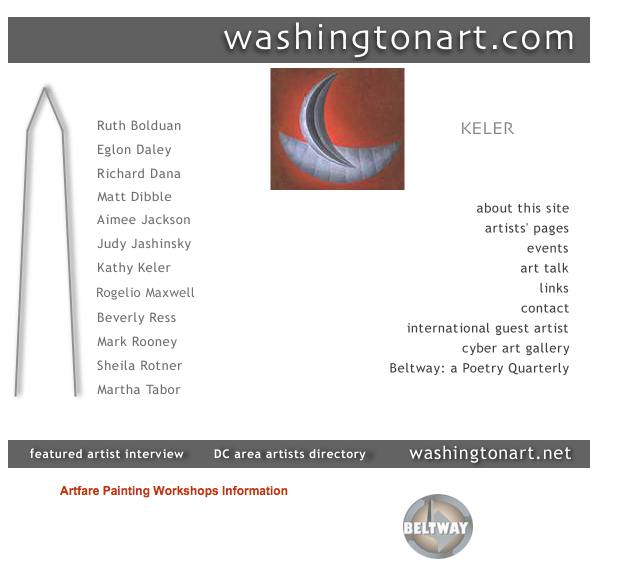 So Kathy started a site called WashingtonArt.com. Because this is just Kathy and the spirit of community is always with her, she started the website to focus on her own work, but she thought the site would be more interesting to people who owned galleries if it featured a lot of Washington-area artists. She ended up with 12 visual artists on the site. She had to help them make digital scans of images of their work and upload them. But many people didn’t do anything to update their web pages, so initially it was a really static site. She came to me and asked if I would do a poetry feature that would bring in a new audience. Kathy said she wanted something to be updated every month and I thought that was crazy. That’s way too much work! But I thought maybe I could do something four times a year. So that’s how the journal ended up being quarterly. She designed the logo, made templates, taught me basic coding. For the first 12 years of the journal’s life it was on WashingtonArt.com. Our old archives are still on the site. M: At that time I’m guessing there weren’t many other digital poetry mags? K: There were digital magazines starting around 1999. So we were certainly not the first, but we were an early adopter. I would not have done this on my own. It was Kathy pushing me and encouraging me to learn these new tricks. It’s grown from there. I think the first issue that I did featured four poets. M: Did you have any idea how big the internet would be for arts and culture? K: We were getting a sense already. I started working on this in 1999 but the first issue came out on January 1, 2000. What I liked about it was that distribution would be really easy. You could reach people who might not ever go to a bookstore or library and pick up a print journal. Right from the start I really loved the idea that people with disabilities could use adaptive technology to read stuff on the screen. And the journal was also available for free to people with low incomes. To me it seemed this was a really democratic platform. K: Yeah, well, how old were in you January of 2000? M: I was eight! I had no idea what was going on. I was like just trying to befriend my neighbor because she had a trampoline! K: You grew up with this. Whereas for me it was a huge transition. M: And that’s where I think the fluency aspect comes in. If you want to make a language metaphor, I’m a native internet speaker. K: Right. In the early days there were people who were so against publishing online. There was this whole debate about digital publishing as illegitimate. Now of course every single print journal has an online presence and they republish some of their stuff digitally. M: Would you say there is carry over from that early attitude toward digital magazines and journals? K: I adore print culture. I do. I mean, here we are surrounded by my books. There was never a thought in my mind that digital would replace print culture. This is a tool. I have always hoped that when people found authors online then they would be predisposed to go find books. Poetry is a great medium for the web because it tends to be shorter and you can read a whole poem without a lot of scrolling. But still, it is a different experience reading off the screen. M: I agree. I would never want to read an entire collection or a novel off a screen. I mainly read poetry, short stories, and articles online. Reading on the internet is done in snippets. K: I love that word, snippets. For me it was never about online competing with print. That’s absurd. But, for a long time in the literary community, digital was considered to be in competition with print. M: What are you reading right now? K: Right now I am re-reading a classic slave narrative called Incidents in the Life of a Slave Girl by Harriet Jacobs, who originally published under the pseudonym Linda Brent. M: I read that a couple years ago. How are you liking it? K: It’s very powerful. I’ve read it in the past but it was years ago. A lot of classic slave narratives are by men, the really famous ones at least. So I wanted to go back and re-read her. Just this morning I finished reading Jean Cocteau in a new translation by Mary-Sherman Willis. The translations are terrific, and I’d highly recommend the book. It’s called Grace Notes and just came out earlier this year. I’m almost always reading three books at a time. Usually non-fiction, fiction, and poetry. M: Me too! I have always liked reading several at once. K: So what are you currently reading? M: I’m reading Schizophrene by Bhanu Kapil, a writer who currently teaches at Naropa University. I guess she could be classified as experimental or hybrid. K: Do you read a lot of experimental work? M: Yes. I usually prefer life writing, notebooks and diaries that are almost performative. K: You’ve been holding out on me! I am very excited to hear this because my background is academic. Gowri has a performance and spoken word background. It will be nice to have your aesthetic to round us off. We need someone who is doing more experimental reading. M: I like experimental because when it’s bad it’s really bad and when it’s good it’s really good. Schizophrene begins with an account of Kapil throwing her notebook with the entire hand-written draft of the book out the window into the snow. Whether that’s “real” or not is beside the point. The performance of writing fascinates me. K: And is your own writing like that? It’s about the process itself? M: Yes. It is mostly notebooking. Short-form notebooking. But this interview is about you! K: Journals are such a great source for poems. I have a book-length poem about my experience living in India called The Kimnama. I kept a notebook and then I edited it down and that’s the poem. M: I would love to read that. M: Could you name a contemporary DC poet who is most exciting to you right now? K: I don’t want to answer that question. Of course there are poets I reread all the time. But I pride myself in having wide-ranging tastes and I don’t want people to think by naming someone publicly that I’m playing favorites. M: That’s fine. But I’m definitely going to include that you didn’t want to answer the question. K: I don’t want people to ever feel like they should be writing towards one particular aesthetic or only send poems to the journal that are like poems we’ve published in the past. A lot of journals operate that way. But we’re not about publishing one type of poetics. We’re about capturing the widest range in this geographic slice. K: What is this “you guys”?! We! M: I keep forgetting! We publish, we publish, such a broad range. K: That’s the project! I have lived in other cities where the literary community is really fractured. The people who are writing experimental work do not talk to the people who are more academic, and people who are doing slams are completely separate. DC is not like that. I’ve always been curious as to why. I think that partly it’s because we are a company town, with the federal government being the company. We’re not known as an arts town. We have to stick together. But I also think there’s also a more generous spirit here than a lot of cities. Many cities are heavily competitive and I’ve always liked that DC is not. Writers support each other. I want Beltway Poetry Quarterly to reflect that community. The cohesiveness of the community. We don’t always succeed. But that’s the goal. M: So many people get caught up, myself included, in what brand or type of writing most excites them personally. K: When you go to readings here in DC, you see people across the spectrum supporting each other. Which is very cool. When I think of other cities, particularly New York or Los Angeles or Boston, they are places where writers seem to have more of a sense that resources are very limited. Writers feel they have to compete, not that they could gain momentum by working together. M: That’s interesting to me because I consider the professional world here to be very competitive. K: Maybe that’s why the arts community emerged in opposition to that. K: In the arts we sort of acknowledge that the bulk of us are doing this for love, to create more meaning in our lives, and not for money. Money is probably never going to be a major part of this. M: Is “purified” the wrong word? K: Not at all. Because in a way poetry is disconnected from the commercial realm. This does leave a more pure, emotional connection. M: People aren’t getting into poetry to make a buck. We are all truly obsessed with it. K: I have a lot of friends who are visual artists and there’s a tiny percentage who can make a living from their art, and just because there’s that possibility I think visual artists are more tortured. Whereas, even poets who are internationally renowned are not making money from book sales. If they’re making money it’s from teaching or speaking gigs. I like that poetry is separate from all the practical day-to-day. M: You managed and edited Beltway Poetry for so long by yourself. You have made recent staff additions, myself included. What is your main motivation in expanding? K: I think because I ran the magazine for so long on my own people started naturally associating it with me. I want new energy, to get other people’s ideas, I want Beltway Poetry Quarterly to not be some egotistical, self-identified thing. We needed change and this was a big change! I wouldn’t mind if the staff got even larger. My hope is that the journal can outlive me. The only way for that to happen is to bring in new people. More people need to feel ownership of it. I would like Vol. 21.1, Winter 2020 to be my last issue. It will be a 20-year retrospective. We have a couple more years to expand and make sure that we have enough people with the skills and commitment we need to keep the magazine running beyond that point. George Washington University’s Gelman Library has a particular interest in collecting Washington, DC writers. They are doing digital captures of the journal and it will be archived on the university website as a tool for researchers. I would also like to donate whatever paper archives and records we have to the university. I’m thinking of ways to continue the journal beyond me and preserve what has been accomplished over this time. Twenty years is a long time for one person to edit a literary magazine. M: Have you accomplished much of what you wanted to when you first started Beltway Poetry Quarterly? K: Early on I made a list of local writers I wanted to feature. Over time I’ve added to that list. I will never publish everyone on the list! At first I assumed eventually I’d run out of people, but it turns out you never run out of people to publish. M: You know so much about this area and its history and the writers here. You’re unmatched. K: Because I’ve been doing it for so long! It’s not because I’m really smart or really connected. It’s because I stayed still. I stayed in DC. M: You have gained respect and built a reputation in this community in a way most people never experience. K: That would be nice to think that I’ve developed a reputation and respect. But I know there are people who think of me as a kind of gatekeeper. I’ve made enemies from this as well. M: I would love to meet your enemies. K: I went to an opening at a gallery a few years back and I was hanging out with some visual artist friends and they introduced me someone who was also into poetry. When I told him my name I thought he was going to slap me. He said something like, “I’ve heard of you, you would never publish me.” I said, “Well I might! Have you ever sent me anything?” I do think that there are people who feel like I’ve decided in advance against them. 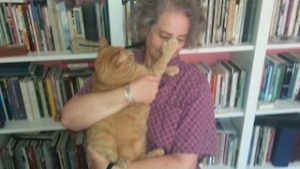 There are people who feel shut out of the literary community, who see themselves as outsiders, and think that I’m some sort of unapproachable gatekeeper conspiring to keep them outside. I know there are people who, when we have open calls, get rejected and they feel resentful about it. I would love it if everyone felt like they should continue to submit. But unfortunately, people’s feelings get hurt and that doesn’t happen. In every issue, especially the themed issues, I am very aware of how many people we have published before and who we are publishing for the first time. I like republishing authors because you develop a relationship over time, but you also have to bring in new people, or the magazine stagnates. One of the main motivations for increasing the staff is to bring in new submissions. 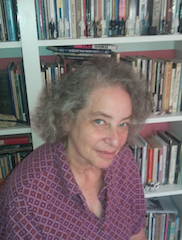 Margaret Corum is co-editor of Beltway Poetry Quarterly. She graduated from Virginia Commonwealth University in 2015, and completed course work in psychology, gender and sexuality, and literature. She has worked as a baker, barista, editor, arts writer, production assistant on a documentary film, and in creative media production. Recently, she completed a residency with Hampton Consulting & Film. In addition to poetry, she is interested in digital publishing, media production, film, social media, and her four tomato plants.